- App to securely view live video while home or away. 100% Wire-Free & Battery-Powered - Two rechargeable 18650 batteries powered achieves Wire-Free, ultra-long standby time up to 8 months. Easy Install - Magnetic mounts let you directly place cameras wherever you want to monitor, no cords, no wiring & no installation needed. 110-degree field of view with 720P Full HD video quality. 720P Full HD & Night Vision - Night vision cameras work even in the dark. 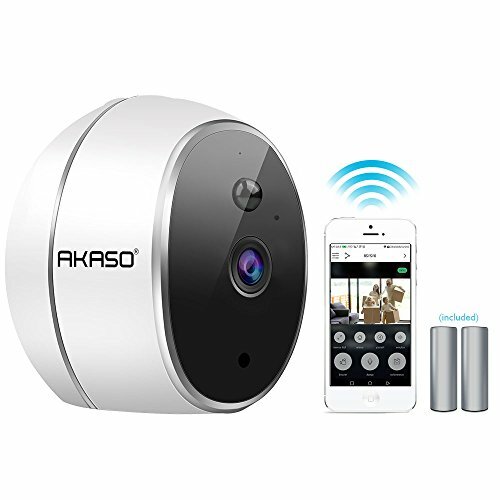 AKASO security camera let you see sharp and clear images and videos. Smart PIR Motion Sensor - Motion activated cameras and real-time email or app notifications, support you dial 4 family members' phones at the same time. Two-Way Audio - The built-in mic & speaker allow you to view and listen to what's going on wherever you are.